The course is currently fully booked. Please contact me on the link below to receive news of future bookmaking courses or to join the waiting list. 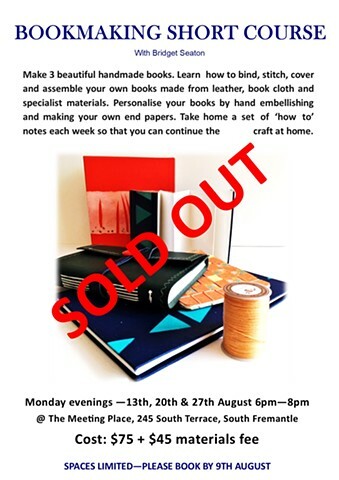 In this short course that takes place on 3 consecutive Monday evenings in August you will make 3 beautiful handmade books. Learn how to bind, stitch, cover and assemble your own books made from leather, book cloth and specialist materials. Absolutely everything is provided including tea and coffee. Select your own colours and threads. There is time to be creative and personalise your books by hand embellishing, hand stencilling and making your own end papers. Take home templates and a set of ‘how to’ notes each week so that you can continue the craft at home.